Here is a simple code for reading tags from the id12 RFID reader. It should be quite easy to modify if you know the dataformat your reader is sending out. ID-12 schematics, originally uploaded by hc gilje. 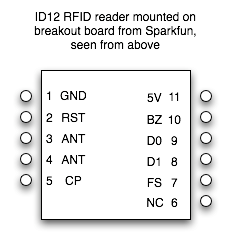 If you are using the breakout board from sparkfun, the pinout is as seen in the image below. Great project! A friend and me been trying to set up a ID-20 and a bluesmirf to connect to a Max/msp patch on my mac today. We soldered together the components and managed to connect the smirf to my mac. There is a copy the above patch running and when i set up the correct port, the indicator light in the smirf stopped flashing comes on red. When i move a tag near the reader the led connected to the ID-20 comes on. I’ve had hassle with mac and bluetooth before, but we have tried all the tricks i know off. Maybe you have some suggestions? the only issues I have heard from people trying out the patch, is that it might be necessary to adjust the thresh value to get the right number of values collected, but you are not getting anything? Maybe try to add a print object to see if anything at all comes out of the serial object. Since your ID-20 indicates it registers a tag, and you have a bluetooth connection, the only other problem I could think of is that there is a problem with the connection between the ID module and the bluesmirf, or that your format pin is not set right (to ground on the ID12, I assume the same on the ID20). 🙂 got it to work! I have no idea if your code would work, sorry, but maybe someone else sees your comment and can help you out. Hi could you give me details on implementanting the above with a PIC microcontroller? I know we have to hook up the output of the ID-12 to the EUART of the microcontroller – however i’m worried about overflow and underflow and detecting the actual RFID serial no. within the PIC. I only work with the arduino. I may be able to help because I designed it. Really nice to see all the applications you that you have all put this module to, amazing. I actually have the same question as chock. I just got my ID-12 yesterday, and I’ve set up the circuit exactly as it is here (using an Arduino Diecimila). I haven’t been able to get any response from either the LED or the serial port. Is there a quick and dirty way to test if the board is dead? I was curious about one other thing: can you have the serial coming in pin RX (on the Arduino) while monitoring the data over the USB connection? I was under the impression this didn’t work. The circuit diagram for the ID12 has an error. 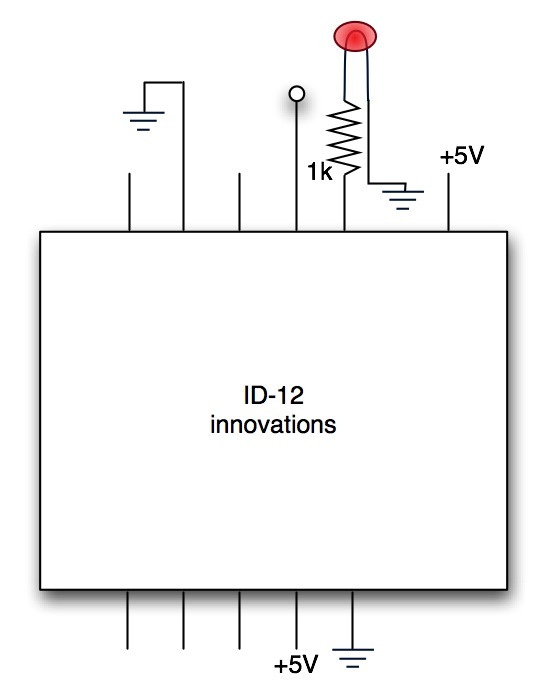 It will blow up the ID12 because the diode is driven directly without a 1k series resistor!!! For some reason I didnt see this last comment before today, and I am sorry if this has caused problems for people, I have not had this problem at all and have used my ID12s for a while. Anyway, I have uploaded a new image to reflect the 1k resistor between pin 10 and the LED. Thank you Hcgilje for posting new cct! Would anyone please tell me what is the specification or the brand name of the tags that can communicate with the 12 core RFID you used cause I need to buy some tags and I am not sure if compatibility would only depend on the frequency of the reader and the tag. I have a question please. I am trying to connect the blueSmirf to the RFID 12 core reader and I am wondering which pins from the RFID should be linked to the bluetooth device. the pin that goes to the microcontroller in the schematic above (the dot), which is the serial out. Have tried it out and it work perfectly. Have connected as shown, and I’m getting response in Arduino’s serial monitor, but it’s only junk data. Specifically, I get “ÿÿÿÿÿÿÿÿÿÿÿÿÿ” for any tag scanned. Anyone have thoughts as to why this might be? Thanks so much in advance! Hi, I got a problem with my RFID reader. It seems that it is only able to read a bunch of question marks when I run the code given above. The LED blinks when I place a card near it but the serial monitor just shows me 13 ? symbols. Is there a problem with my RFID reader? I am using the white RFID cards ( 125 kHz tag). I’m having the same trouble as diana. Outputting the data as hex says it’s just a bunch of FF bytes. Sorry for the double-post, but I had a look at the ID12 datasheet which mentions a 4K7 pull-up resistor to be put on the clock and data pins. Unfortunately I have no idea of how to do this and cannot test it. Can anyone else shed some light? And again, a triple-post. But this time with the solution to the “ÿÿÿÿÿ”/FFFFFF problem; connect a 4K7 resistor between V+ (+5V on the schematic) and pin 9. I have a problem with the ID-12. i connect pin 9 through the Max232 to the computer serial port to see the readed Tag code on the hyperterminal. when power on the led goes red even there is no tag to read. and the hypertermial didn’t receive anything (if the tag exist). can anyone explain this to me?did the ID-12 IC blow up. i am having the same ffffff problem, i tried a pullup resistor but it doesnt work any suggestions? I have the same ffff problem…. The thing is that the ID12 isn’t responding to changes in format pin… in other words the output is always in Wiegand26 format. (I have a logic analyzer). I don’t know what I’m doing wrong (I’m using pull ups resistor and connect the format pin to GND! To solve the ffff’s problems you have to use pull up resistors. There’s another problem with this IC. You MUST disconnect the power supply pin of the IC and connect it to GND. After this step the IC takes the new configuration of the format selector pin (7). (5v – Wiegand26 ; 0V – Ascii; PIN 10 – Magnet Emulation). This is because the reset pin doesn’t work as expected. You don’t need to use pull-up resistor in Ascii Mode. If you’re using pull up resistors and still getting FF’s, your problem is that you’re in Wiegand26 format output. Change the output to Ascii mode as I described in my last post. i m working on rfid project. i do no know how i connect pic16 to id-20. please sent me schemetice daigrame and programe. And: It is possible to upload software to the arduino without cutting the RX -> Pin 9 wire. Just put a diode between the RX pin from the arduino and the pin 9 from the ID12 module. It works great! This is great, thanks a lot for sharing. I’ve got everything working via arduino into max and am now trying to use a bluesmirf. I’ve got the bluesmirf going in max, at least the light goes green anyway. And the ID12 LED is still lighting when I scan, but I’m not getting anything into max. Am I connecting serial from ID12 to the RX on the bluesmirf, doesn’t seem to work? I would first get the bluesmirf working properly. The light should be red when it is connected to another bluetooth device. My apologies if this is off-topic, but I’ve recently purchased 125 KHz RFID readers from China and I get different results depending on which reader I use. One reader provides the number that is printed on the tag and the other produces a longer number that appears to be a fixed offset from the first. ie the same card data is interpreted differently by each of the two readers. Some of the cards that I purchased had two numbers on them – and these turn out to be the numbers that I’m seeing from each of the readers. I’d be grateful for any advice here. I’ve tried to work out the relationship between the two values returned but have so far been unsuccessful. Kindly include a full circuit to connect the ID-12 to computer RS232 port, does it needs a level shifter. Which pin is used as RS232 out 8 or 9? 1/4 W is enough for 1KOhm resistor? This is using AVR studio 4 and atmega168 microcontroller could u please help ..
neel – I have posted an instructable called “RFID Car immobiliser with PIC12629” It’s much simpler than the AVR type and i could write code to make it into a normal access module if you like. At the moment it just latches a relay on reading a tag and successful match with one in EEPROM. I could change it to be momentary output (5 seconds or something like that) suitable for an electronic lock. Post me a message on instructables if you’re interested. Will this module gives serial output data? How could I interface ID-12 with 8051 micro-controller. Currently I’m using AT89S52 and connect directly pin 14 (T0) & 15 (T1) to pin 9(DATA0) & 8(DATA1) of ID12 respectively. I followed the ID12 circuit exactly from the datasheet but still not working to detect any card present. Do I need MAX232 in between or any external antenna? Hi, I have the same problem as alex. When reading any card FFFFFF throws me, I know the end is the solution, please help. I have aproject this year,and my project contains of Skye RFID mini,who can I connect it to the computer to read the tag??? Hi, I’m working with ID-12 in my arduino proyect. I have the same ÿÿÿÿÿÿ trouble and i have read all coments. I tried the above solutions, but I still have the same problem. Who can tell me how to solve this problem? Excuse me for my English. hi im working with the id-12 for a door lock. Im using a rfid usb board to communicate with my computer. But i’d like to change its output dataformat. is there anyway to so? Question: Can you measure the time it takes to get a response back? I want to use an active rfid tag and use the arduino to figure out how far away the tag is. thanks for the update. The original post is from 2007 so there has been several changes in the syntax of the arduino code since then. Is there a way to add LCD screen to it? I’ve been lookin but I couldn’t find any codes . any help would be appreciated . in the sub patcher there is a comment that you can ‘loadbang for last saved one’ – how to I loadbang the last saved port? I am not sure which subpatcher you are talking about? It´s at least not mentioned in the code I posted.